It’s quite amazing to see Tavistock and Torrington Place now that the Space for Cycling has been doubled almost overnight by giving the westbound motor lane to cycles while eastbound cycles use the former two-way cycle track. Important: The scheme is gathering huge support from cyclists, local residents others as detailed below. But there is also a very strong ‘anti’ lobby. Camden Council need to receive as many commendations as possible. 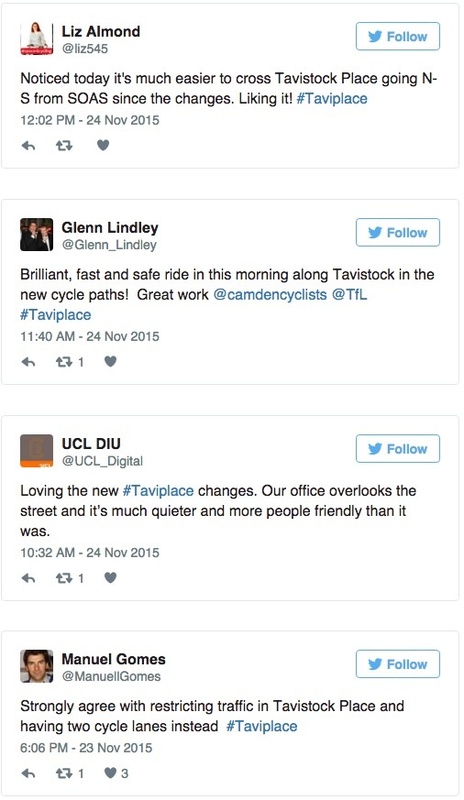 If you think the scheme is a positive change to Bloomsbury please email your appreciation to: torringtontavistocktrial@camden.gov.uk and/or a tweet to @camdentalking including the hashtag #taviplace. 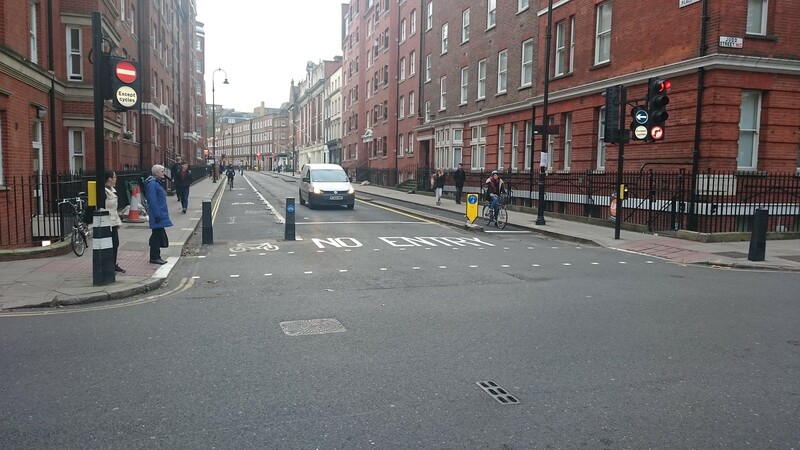 It is quite amazing to see Tavistock Place and Torrington Place now that the Space for Cycling has been doubled almost overnight (24th November 2015) by giving the westbound motor lane to westbound cycles while eastbound cycles use the former two-way cycle track. 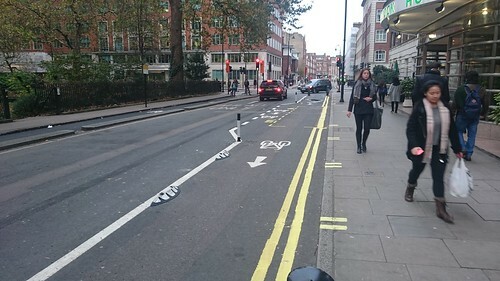 Twitter is full of praise from cyclists, locals and pedestrians for Camden’s innovative solution to the space problems and confusion that the old narrow two-way track was generating. The speed of implementation has been astonishing. The street has been transformed in just two weeks: first the road was closed to all westbound motor traffic by placing barriers at all of the entries together with some improvised “No Entry” and “No left turn” notices . 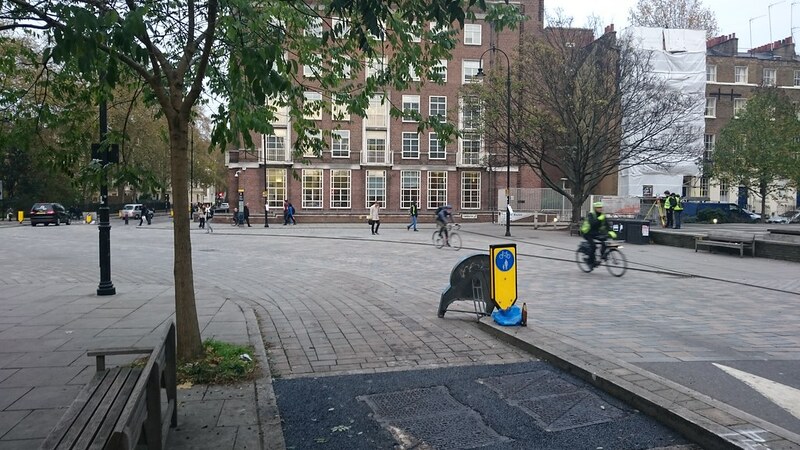 Then the Orcas (lightweight segregation, like the Armadillos on Royal College Street but asymmetric) were fixed along the middle of the road to define the boundary of the westbound cycle track. Meanwhile, engineers were working on the permanent displays at each of the signal heads at all of the junctions, so that they displayed official “No Entry Except Cycles” or “No left turn Except Cycles” or “No right turn Except Cycles” as appropriate. 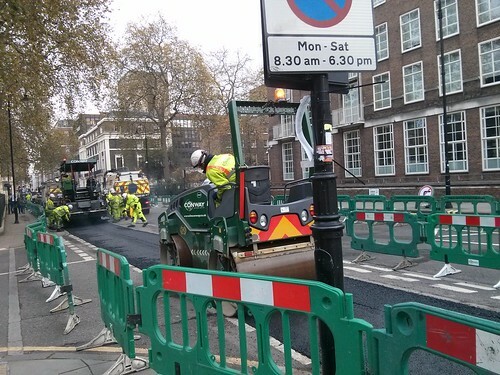 Then the machines came in to resurface the former two-way track and then to mark it as the eastbound cycle track, working until the Sunday before the opening on Monday 23rd. This was done because the surface was damaged and the lane markings needed to be burnt off anyway. 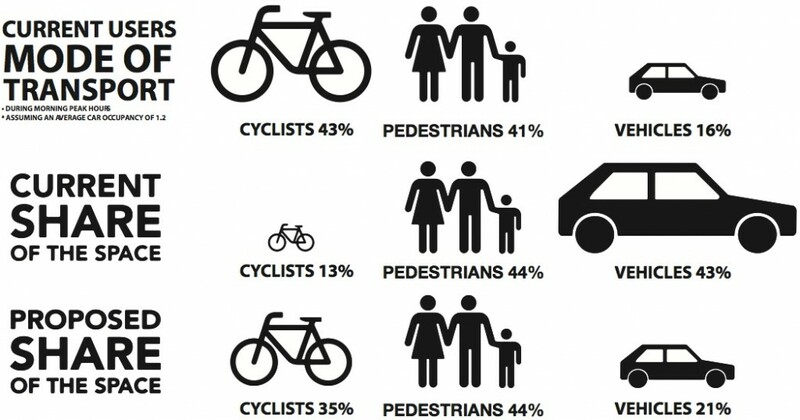 The graphic below (produced by Camden Council) shows how the road is shared between its users. 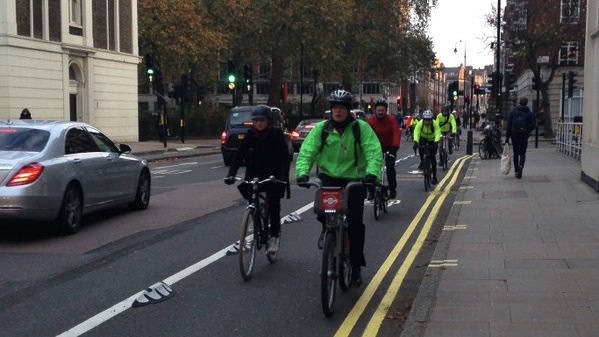 Clearly cycles now have well over half of the road space. When the two-way track was installed in the early 2000s, CCC had suggested making the street one way so that there would be room to have a track on each side of the road. But people weren’t ready for this and anyway, the two-way track was sufficient for the number of users at that time. But 10-12 years later it was getting desperately crowded making it unpleasant for its users and for the people who walk in the area. In spite of the overcrowding people continued to use the route with more than 1000 cyclists using it every hour at peak times by Summer 2015. We knew that Camden wanted to improve the situation and in Summer 2013 we launched a campaign to upgrade it with a video illustrating the problems on this route. Funding became available via the Central London Cycling Grid and TfL’s report in Dec 2013 mentioned that Camden was investigating the creation of a Cycle Street for Tavistock Place and Torrington Place in Bloomsbury – by restricting through traffic. Then in Jan 2015, the report on the West End Project proposed a trial such as we now see before us as a measure to reduce motor traffic in Torrington Place by reallocating the entire westbound carriageway between Gower Street and Judd Street from motors to cycles. This was followed by the design work needed to plan all the details now on the street. Trials have the advantage that they can be carried out without time-consuming modelling. On 1st July 2015, Cllr Jones signed off the experimental traffic order which is all that is needed for a trial. There was then a delay of a few months for the rather minor traffic signal works such as adding new illuminated direction signs for cyclists and traffic to the traffic signal heads (e.g. banned turns) and because TfL did in the end require some modelling. Thanks are due to Camden Council, in particular to Cllr Phil Jones for his consistent support and understanding of what people need to cycle and to the following Camden offic ers: John Futcher who set the ball rolling and kept pushing the project on its way, to Simi Shah whose design team has done excellent work on the details and to William Okpoho who supervised the implementation. We were promised something that was quick and cheap to install, but the result is amazingly well finished including details such as the “No left turn Except Cycles” at the Judd Street junction. 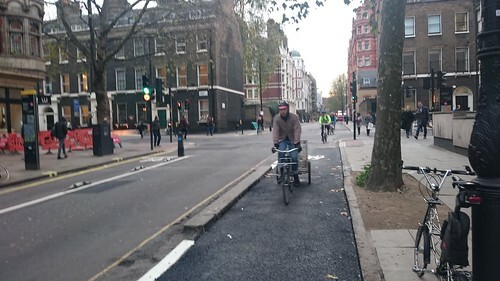 Thanks are also due to all those members of Camden Cycling Campaign, LCC and others who have contributed so much of their time to campaigning to bring it about. The team who produced the video illustrating the problems deserve a special thank you too. We would have preferred not to have the taxi bay outside the Tavistock Hotel but if we have to have it, we do believe that a kerbside bay is preferable to a floating bay because in the latter case, there would be a risk of dooring as passengers step out of the taxi. Fortunately the usage of this bay is fairly low. We would prefer to have separators (e.g. Orcas) on passing westbound through Byng Place since we don’t believe that the presence of a uniform surface of well-laid granite setts is going to tell drivers to leave us plenty of space for cycling. But maybe this calmer street may tame drivers to a level where they will respect our space. We are working hard to make sure that the council and others are aware of all the support there is for the new scheme, not just from cyclists but from local residents, businesses and of course all the educational institutions in the area. We expect that traffic will eventually find other routes, or in some cases other modes of travel. If that comes about it will provide simple “proof of concept” that half of the road space can be reallocated from motor vehicles to cycles without creating tailbacks all over Zone 1. There are still a many loose ends such as a posts with black bags over their signs and puddles outside the hotel, but each day that we visit, a few more of them have been fixed. However, we are making a snagging list so that we can ask Camden to make minor changes during the trial or more major ones when an opportunity arises. Please wait for a couple of weeks for things to settle down and then report any that you observe to Jean Dollimore (email address on Contacts page). 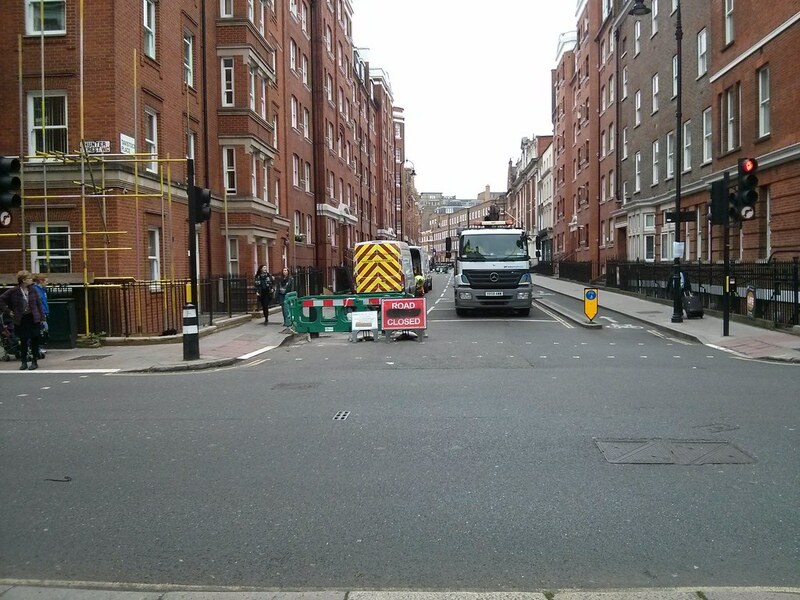 We have already noted the difficulty of turning right from the end of the eastbound track on Tavistock Place into Hunter Street caused by being on the inside of the motor vehicles. Until it is fixed, a possible solution is to cross Judd Street and wait in front of the ASL box on the southbound side of the road. 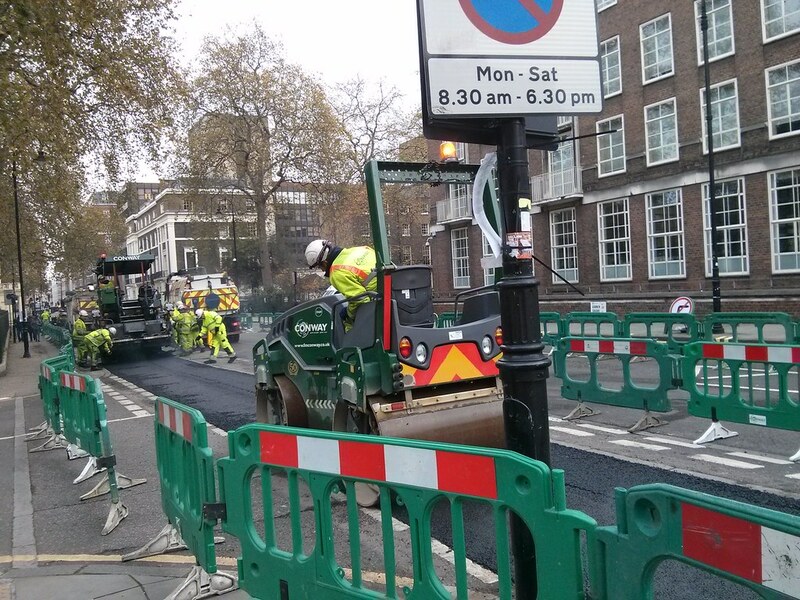 Cycle lanes near UCL to be doubled in trial by Camden Council. Green UCL. Nov 2015.